Good news, he argues strongly that methane emissions can not be treated justly in an ETS because the carbon (CO2e) unit does not reflect its true impact on global temperatures. It would be very unfair to emitters who were not increasing methane emissions, and conversely let those who are increasing their emissions off too lightly. I have written to the Interim Climate Change Commission with this information. The Commission is reporting to the Government next month on how it can bring agricultural emissions in to the ETS. The Professors unequivocal message is that it can’t. Myles Allen’s main focus was not on the ETS, (and let’s hope his comments will help get methane’s inclusion in it kicked to touch) but on the carbon zero bill and how to treat methane. His position is that methane emissions must reduce by 0.3% per year in order to not be causing global warming. He concluded this by apportioning a certain amount of cumulative effect to methane and discounting its emission rate by 75%. The formula he came to meant that the annual emission rate matched the impact on global temperatures a climate model he used attributed to methane. I will blog about it in more detail when his material arrives but my first concern is that he relies on a climate model and then writes a formula to fit the model. And of course it all hangs on the credibility of the model. Now I don’t want to make any judgement on his position and am not qualified to do so anyway, but I would like to see if his physics and mathematical model approach match the atmospheric chemistry approach of other scientists. 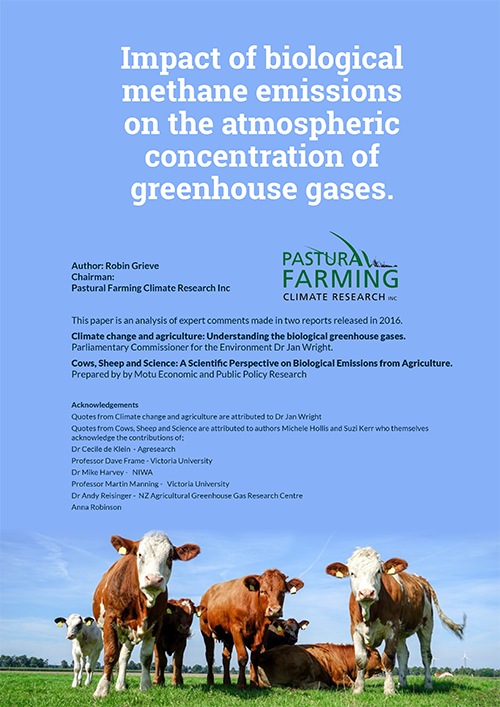 In other words, what is happening to the atmospheric concentration of methane in his climate model when methane emissions are stable and when they are reducing at 0.3% per year? If we are to accept that stable emissions cause global warming is that because the concentration of methane is increasing even when emissions are stable or is it that global warming occurs despite the concentration not increasing? I was also not able to ask him if attributing a small percentage of accumulation to methane for his formula was because methane does accumulate or whether it was just to match the model. There is no consensus among climate scientists about what to do with methane and I suspect his is just one more view. Where there is some commonality is that the current CO2e system does not work. Myles Allen’s approach is good in that it confirms what we set out to say 10 years ago which was they got it wrong about methane but it is not all good news for farmers. He argues for a methane reduction, albeit very small and possibly doable, whereas others argue there is no point in reducing methane at all until CO2 is at net zero. I don’t think the crowd, who were mostly global warmers, liked his message too much but then it was not exactly a hit with the farmers either. His main take is that NZ is the only country which really has this methane problem so it is up to us to lead the world in figuring out what to do. I talked to him afterwards, he had viewed our video the “Methane Mistake” and his only comment was that he thought I had been a bit hard on climate scientists because he said he and others had been telling the politicians for 30 years that they had got it wrong about methane. I told him I had not heard many NZ scientists saying that, and hence my attitude to them. I suspect getting it wrong about methane will continue for years to come because there are so many different views and so much unknown about methane, the politicians do not stand a chance of getting it right. Interestingly, NZ Stuff who do not allow any dissent to the global warming narrative to be published in their propaganda bulletin, refused to publish Professor Allen’s oped. This is laughable as the guy is a global warmer arguing urgency on stopping global warming, and to him getting it right about methane is an important part of that. But because he questions the way methane emissions are understood by the masses, which paints farmers as evil polluters he is shut down. This indicates either Stuff is more interested in painting farmers as evil polluters than in advancing the cause of global warming or they are just dumb. I suspect a bit of both.